Press the lever upward ( ) to increase the volume. Press the lever downward ( ) to decrease the volume. The SEEK/PRESET button has different functions based on the system mode. For the following functions the button should be pressed for 0.8 seconds or more. If the SEEK/PRESET button is pressed for less than 0.8 seconds, it will work as follows in each mode. 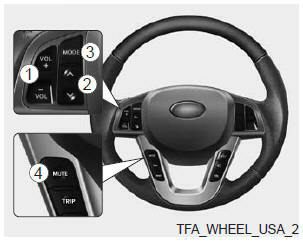 In addition to mode change, Power on/off can be made by pressing this button when the ignition switch is on ACC or ON. - Power OFF : Press the button for more than 0.8seconds when the audio is on.